This collection contains many examples of simple microscopes which were designed as 'Linen provers' including those with fixed standard size openings, and also 'Counting Glasses' or 'Thread counters.' The difference between these is slightly indistinct, but in general, to me at least, linen provers provide a standard opening (which may have a scale on it in later models), whereas a thread counter actually has a moving needle which is moved over the cloth and at the same time a scale to provide a count. Some linen provers have single or multiple standard-sized openings, whereas others have a scale either along the opening, or more recently, in some modern examples, within the optical components. Thread counters all have scales but not all have a fixed opening, and the needle is moved along the scale to arrive at a number for the density of threads. I have a large example that even has a little finger-actuated counter to add up the number of threads as the user counts them (who cannot count by ones?). Currently units of 'threads per inch' or threads per centimeter' have been used, but this was not always the case. One example in this collection provides multiple standards to utilize various units of measure from different countries. In addition to simple linen testers, a few makers produced compound microscopes for the same purpose. Another type of cloth inspection microscope was used in a more qualitative way, to examine the cloth for 'mildew, spots, and stains' an example of this type, made by J.B. Dancer, having a large uncalibrated round opening on the bottom. Dancer's cloth inspection microscope is also a compound microscope and has no facility for counting the density of threads. 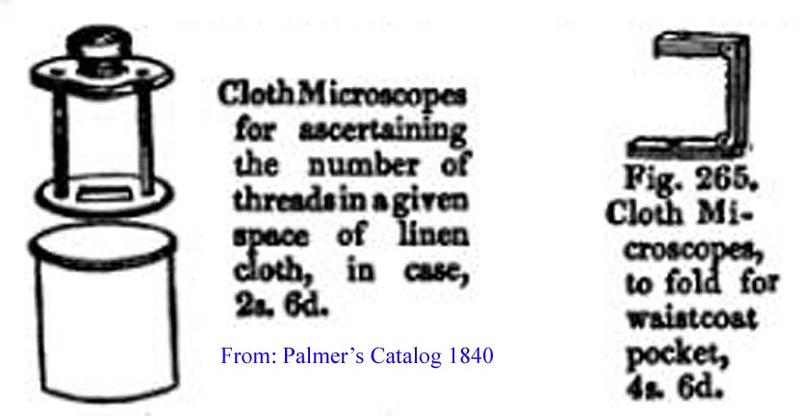 Again however terminology was not standardized, as Palmer's catalog from 1840 calls them 'Cloth Microscopes,' a term some other makers, (like Dancer) used for an inspection instrument without facility for thread counting. For this reason, it is unclear in older catalogs (i.e. before 1840) of what was meant by a 'cloth microscope' where an illustration was not provided. It would seem likely the earliest microscopes used for counting threads had no built-in standards, and that a ruler was simply set on the cloth and a magnifier used to count the threads overlying a certain distance. This accounts for the lack of extant 'linen provers' from before the 19th century. The earliest instruments identified as linen provers are one step beyond this, having a standard sized opening built in. 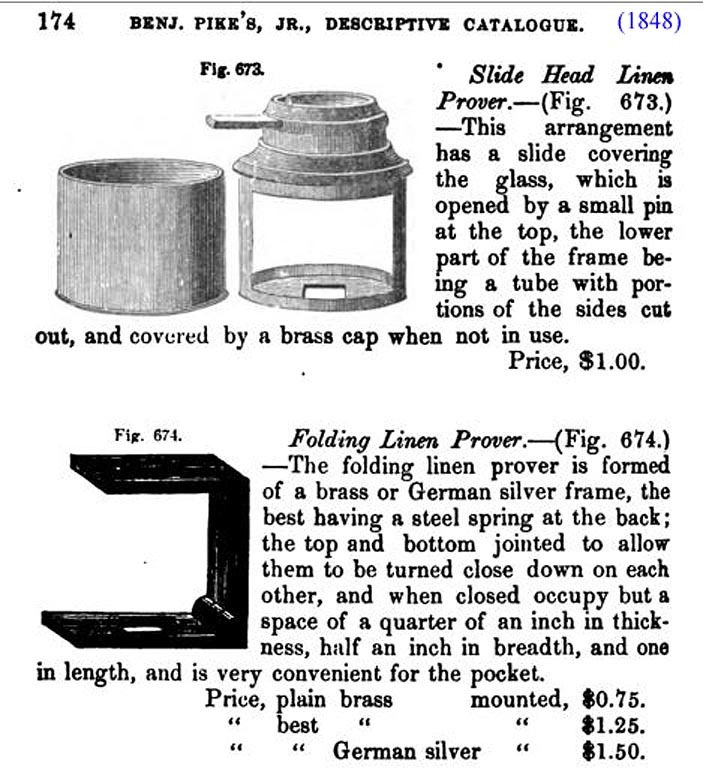 Such examples are pictured in catalogs as early as 1840 (see below). 'THE PILLAR TYPE': In the most basic type, the base has a single tiny pillar supporting the optics above. A sounder design, an example of which is in this collection, is that in which two tiny pillars arise from the base. One of these is shown to the left. The basic form had a fixed focus, but focusing models were available as well. Three examples of the 'Pillar Type' of prover are shown on the Pillar-Prover Page. THE 'SLIDE-HEAD TYPE': One of the earliest variations of these instruments was to add a sliding lens cover. Two examples of a 'Slide-head Linen Prover' are in this collection. Both have fixed focus. They both came in little cans. One can is signed on the bottom by the maker: 'I.P. Cutts, Optician, to Her Majesty, Sheffield.' The other example, shown to the left, has no signature. Both cans are decorated in an identical fashion and are of the same 22 mm diameter, and of the same height, about 37 mm in the can, but the cap from one does not quite fit the other, and the sliders and lens diameters are slightly different, the unsigned example having a lens opening of about 10mm, the signed Cutts version 8 mm. The details of the construction and design are otherwise identical, even to the smallest details, as can be seen after taking them apart. A desire for flexibility in measurements apparently led to 'SWIVELING LINEN PROVER,' a device with more than one standard opening. 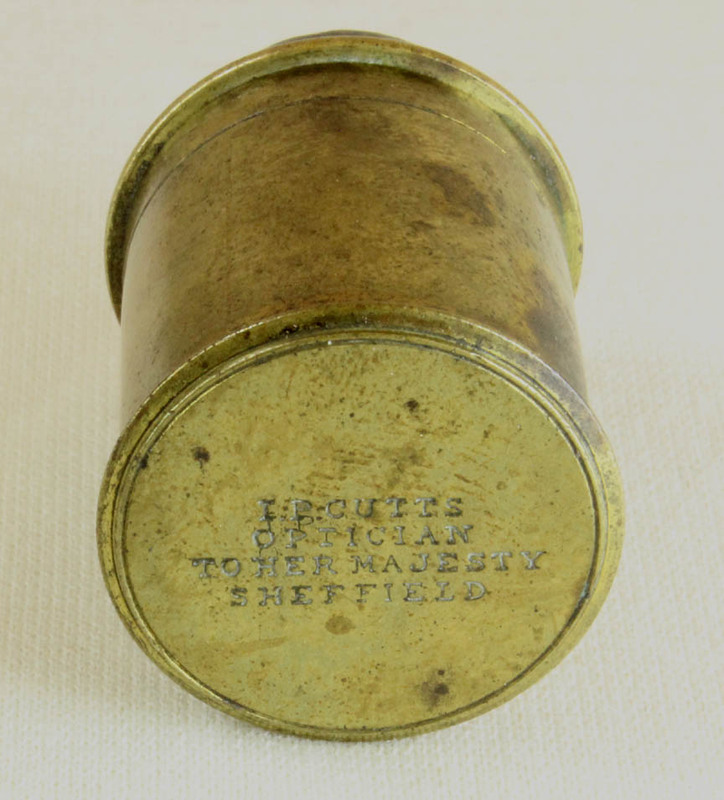 This collection contains three of these, one the more common variety with four unlabelled openings, another, a rare type made in France, with a variety of openings sized for various units of measure around the world at the time it was made, and a third a little later similar to the other one with multiple openings utilizing a compound tube and in a chrome-plated finish. Another variation offered as early as the 1840's (and still made today). is the 'FOLDING LINEN PROVER' OR 'CLOTH MICROSCOPE TO FOLD FOR WAIST POCKET': These instruments, which can vary in size, fold flat when not in use and form a 'C' shape when erected. The earliest forms simply have a standard opening on the bottom, but later versions have this opening marked with calibrations of some kind. Most of the calibrated ones are engraved on one or more edges of the openings; one variation in this collection has 'points' built into the bottom for calibration. The examples in this collection date from the 19th and also the 20th Century. The large variation in size is illustrated by the image to the left. One variant, developed much later, but included here for size comparison, is a folding variety with a moving pointer, and is a folding thread counter. Unlike the others, this has no square opening base; in fact the base opens only with a single scale and the pointer. It still has a fixed focus. The folding provers seen here vary from 2 inches (52 mm) to 7/8 inches (22 mm) in height. The smallest measures 24 mm(l) by 16 mm(w) by 7 mm thick when folded. THREAD COUNTERS OR 'MICROSCOPE CLOTH COUNTING GLASSES': Developed much later, the 'Thread Counting Glass' was apparently first made in the early 20th century (see below). These instruments usually feature a focusable optical unit and the ability to move a pointer against a scale thus allowing a flexible distance to be used for the thread count. 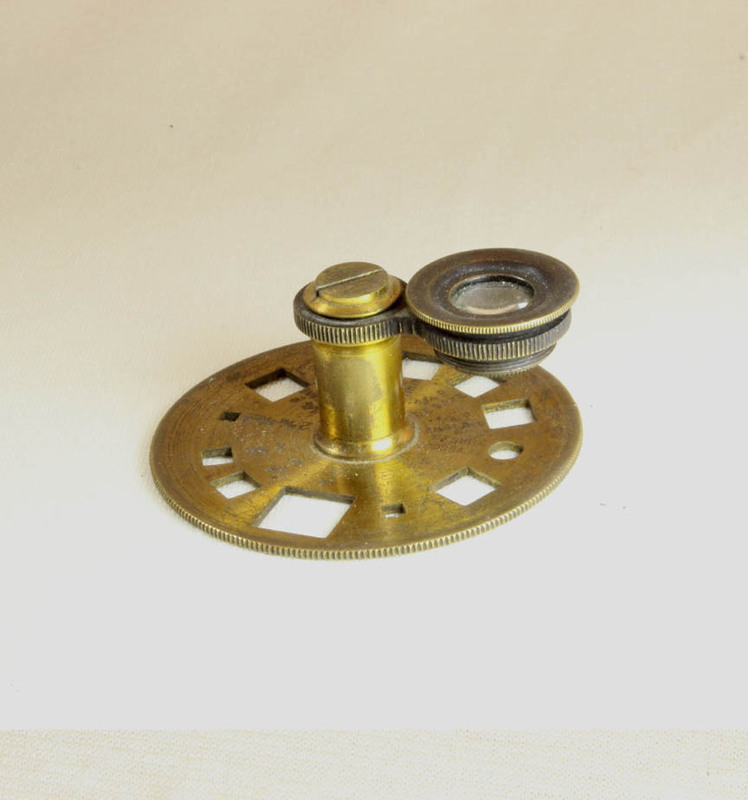 The folding linen tester/thread counter is still made today and an example of a combination instrument, made of metal alloy, is shown here. Not only does it have a calibrated standard opening, but also a moveable pointer for counting threads. This modern variation, from 2017, and obtained on Ebay for only $9 including postage, also adds LED lighting. 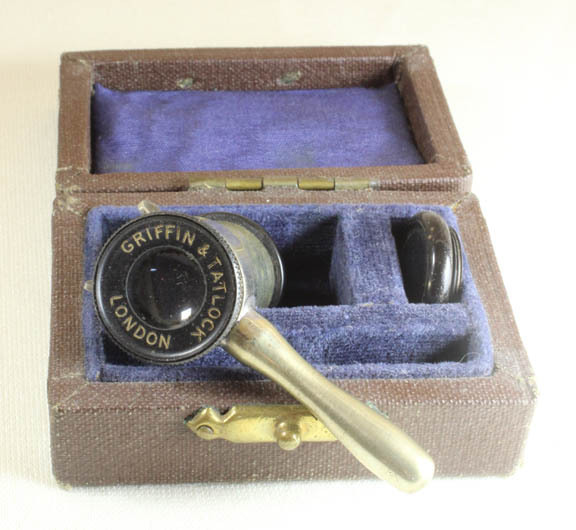 GRIFFIN AND TATLOCK LINEN PROVER WITH EYEPIECE MICROMETER: Developed Later still, the Griffin & Tatlock prover, circa 1950, has the micrometer built into the optics. It includes two alternative optical elements with different scales. Although this prover involves a more 'modern' approach, the folding C-type linen provers are still the most common type made today. Magnification to measure the number of threads/unit of length has often been used to provide evidence of a higher quality of cloth. When one realizes that fibers to make string date back far into the prehistoric period, and woven textiles date back at least to 5000 B.C.E., it is not surprising that the exact date that magnifiers were first used to inspect cloth is unknown. The earliest evidence of any form of magnifying glass dates back to hundreds of years B.C.E. Roger Bacon described the properties of magnifying lenses in the 13th century in England, and the invention of eyeglasses dates back to the 13th century in Italy. When primitive lenses were used, the maximum practical magnification was about 6X, not far from the maximal magnification needed for eyeglasses. At first then, magnifiers used for textile work may date back to the same period, or even earlier, and hence the exact date of their first use this way is lost. Cloth, known for thousands of years was one of the earliest commodities and the occupation of draper, who sold cloth, likely date back as far. Linen, one of the earliest cloths, made from the flax plant, has been made for thousands of years. It is likely that this is the reason that magnifiers used to inspect cloth have been called 'linen provers' or 'linen testers'. It has frequently been said that Antoni Van Leeuwenhoek was in part encouraged to do his famous work by first being exposed to simple linen provers in his work as a draper. 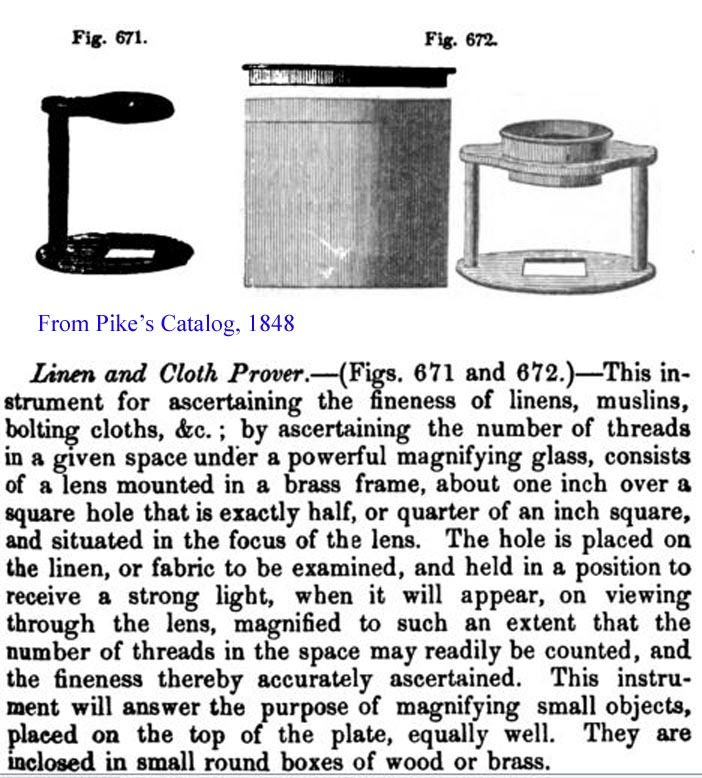 Nevertheless, linen provers identified as such which date to that period have not been identified, and, although he likely used a simple lens to inspect cloth, there is no proof that these low power lenses were his inspiration. 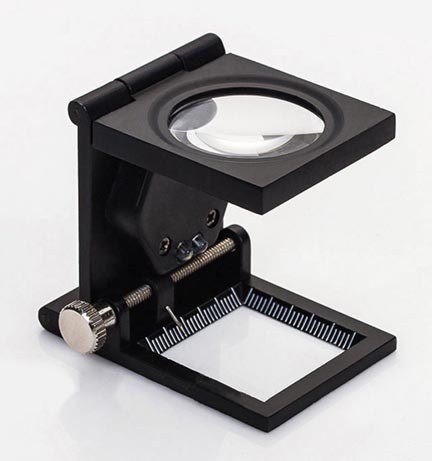 As noted above, drapers before the 19th century likely simply used a magnifier and a separate measuring device together, hence the magnifying device would not easily be recognized as being for this purpose. Indeed, this author is unaware of any extant linen prover dating back further than the nineteenth century. Some of the earliest references to specific linen provers date back to trade catalogs from the 2nd quarter of the 19th century. One such entry, showing different variations, can be seen in Benjamin Pike Jr's Descriptive Catalog of 1848, pages 173-174. Four different types are identified with illustrations; examples of three of these types are found in this collection. Illustrations are also seen in Palmer's 1840 descriptive catalog from the U.K. Among antique simple* microscopes from the 19th and 20th centuries, linen provers are among the most common types. 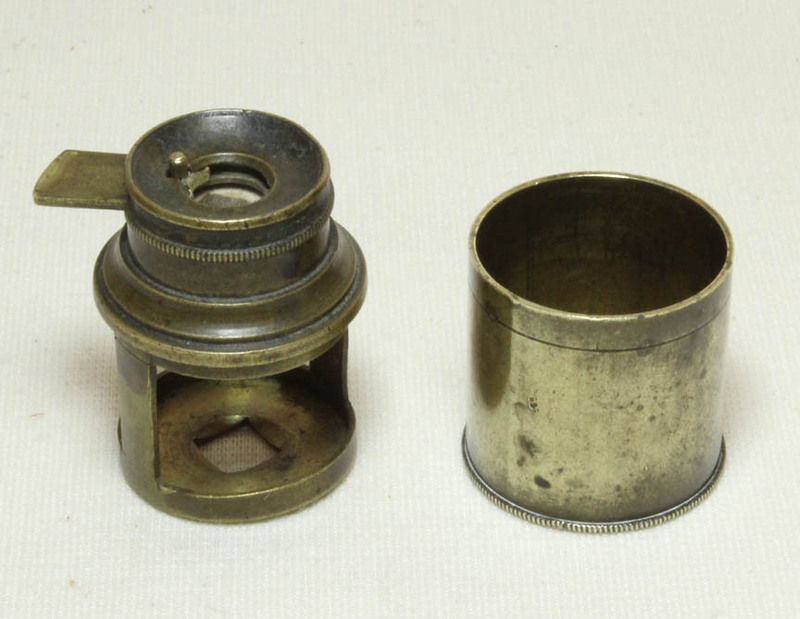 Over the years these simple microscopes were produced in a variety of forms which varied both in size and shape. The microscopical examination of fabric today by scientists, is a much more complicated task, and entails the use of a much more sophisticated compound microscope. Although the term 'threads per inch' is still touted as a measure of quality, this can be misleading, as a high thread count using poor quality thread would be inferior. Linen provers, especially the folding type, continue to be made and sold to this day and are readily available on the internet. As mentioned above, the earliest magnifiers to be used for counting threads likely had no integral scale or standardized opening. The simplest form recognized today is one in which there is a simple single standardized opening, which could measure, for instance 1/4 inch square (or sometimes round). To use this one would simply count the number of threads in the 1/4 inch opening and multiply by four for the TPI count. One of the smallest and simplest of these is represented in this collection by one signed by 'J. Neill & Co., Belfast.' James Neill & Co. succeeded Neill Brothers in 1863. Some of these instruments came in a little case, and occasionally they had a 'slide head' which resembled the sliding covers for the eyepieces of telescopes; these had a separate can to contain the rest of the instrument. This collection contains two examples of 'slide-head' linen provers, one signed by 'I.P. Cutts Sheffield'; John Preston Cutts, an optician and mathematical instrument maker was working from 1822-1841. He sometimes signed his instruments with and 'I' instead of a 'J'. This Cutts instrument may be the earliest example in this collection. Because different countries had different units of measurement, some linen provers had multiple openings of different sizes for the different units of measurement. One such instrument in this collection has multiple such labelled openings. Perhaps the most common type, still made today, is a simple folding version, which when open forms a 'C' shape. Contrary to what one might think though, this type has been offered for sale since at least the early 19th century, and is pictured in catalogs as early as 1840. The lens sits on top, and there is a standard size opening on the bottom. Initially, this form had no scales, but in time, scales were added to the bottom part. These scales could simply be marks like in a ruler, or spikes set a standard distance apart. 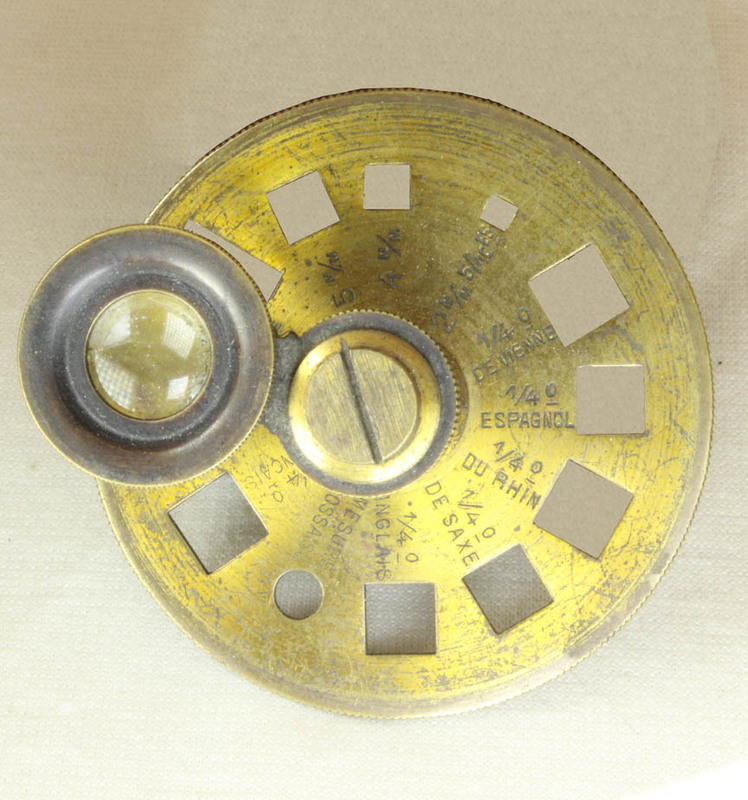 In the twentieth century, production of examples with scales built into the lens, similar to the eyepiece micrometer of compound microscopes, were produced for textile work and one of these, made by Griffin & Tatlock of London is in this collection. As time went on there was a movement towards the instrument referred to as a 'thread counting glass' apparently first available about 1905. Instead of a standard opening, this type suspends the optics above a needle-pointer which moves along above an engraved scale on the base. This pointer is advanced via a worm screw. 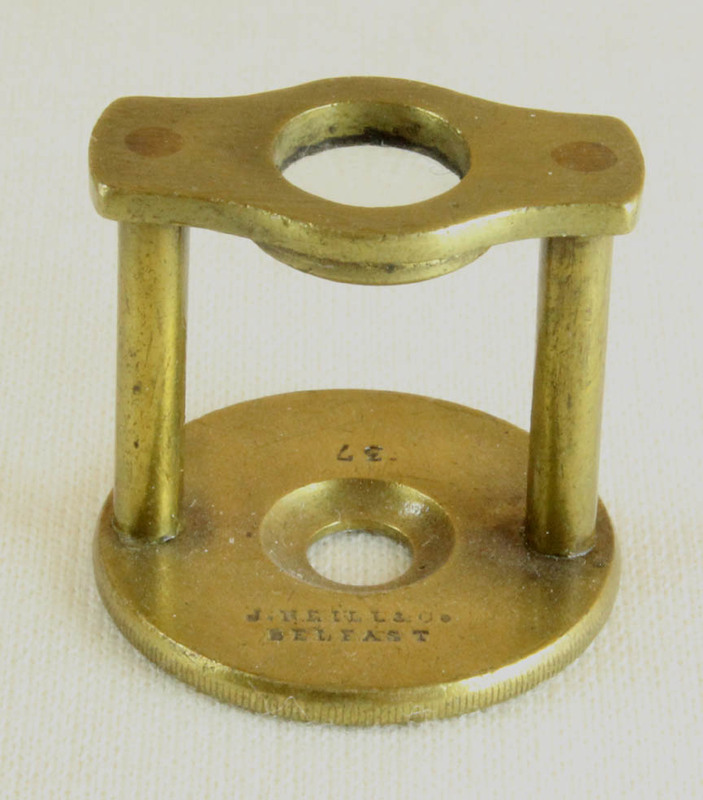 This type of tester came in a variety of sizes from about an inch to six inches in length. Casertelli's was announced as a new device in the 1906 volume of the 'Textile World Record.' The advantage was noted to be the much more flexible length of cloth to be included in the count within the limits of the instrument. This limit was apparently increased in some examples as seen in this collection. My examples have a range of less than two inches to over four inches, the length of the largest instrument, being about seven inches, but with only four inches of scales. The latter instrument was clearly made in the twentieth century for heavy duty work. Among the best known makers of these in the U.S.A. was the Alfred Suter Company, initially in New York city, still in business today in Florida. Another seller whose thread counters were popular in the U.S.A. was Charles Lowenson. The designs he sold were patented in 1910 and with more features in 1929. The biggest example of a thread counter in this collection is a model by Suter, and it even has a little counter to register the count as the needle is advanced. Thomas Armstrong & Brother of Manchester produced a thread counter similar to, but not identical to Casartelli's at about the same time as Casartelli. *'simple' in the context of microscopes refers to the use of a single lens or set of lenses as opposed to the 'compound' microscope which has a separate eyepiece and objective, each separated from each other by a cylindrical optical tube, usually of several inches length.